At the beginning of March we published a blog post analyzing CVE-2015-0311, a Use-After-Free vulnerability in Adobe Flash Player, and we outlined how to exploit it on Windows 7 SP1 machines. As we mentioned at the end of that article, the exploitation process explained there doesn't apply to more recent versions of Windows like Windows 8.1 with Update 3, because of a new exploit mitigation technology called Control Flow Guard (CFG). CFG – which was introduced by Microsoft in Windows 8.1 Update 3 in November 2014 – adds a check before every indirect call in the code in order to verify that the destination address of that call is one of the locations identified as “safe” at compile time. If that check fails at runtime, the program detects an attempt to subvert the normal execution flow and exits immediately. 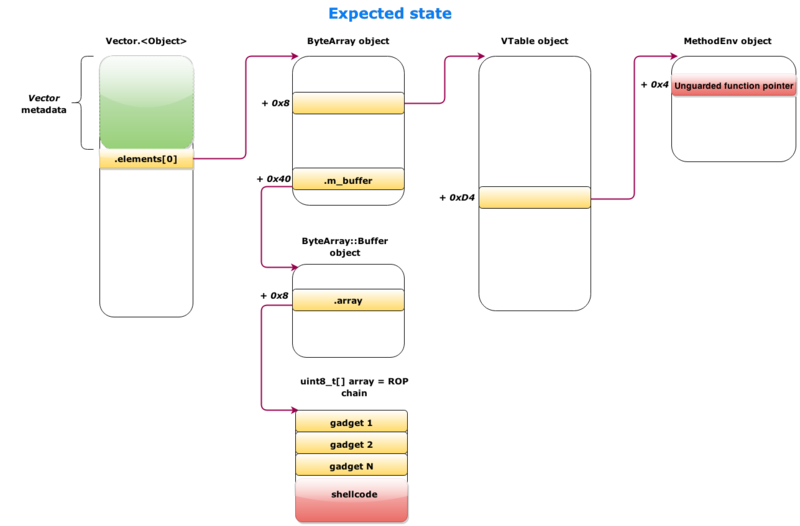 Prior to the existence of Control Flow Guard, leveraging a vulnerability like a Use-After-Free into arbitrary memory read & write primitives – as we did with CVE-2015-0311 – used to mean circumvention of ASLR and DEP and ultimately reliable code execution. The interesting thing about Control Flow guard is that now, even having those powerful read & write primitives, being able to gain code execution may require a noteworthy additional effort. It turns out that the Flash version for Internet Explorer 11 that is integrated into Windows 8.1 Update 3 is compiled with Control Flow Guard enabled, so the well-known technique of overwriting the vtable of an object with a pointer to attacker-controlled data and then calling a virtual function on that object will not work. Let's find look at how we can bypass Control Flow Guard when exploiting Adobe Flash Player on Internet Explorer 11 running on Windows 8.1 Update 3. This post assumes that you have already read part one, so we are going straight to the point where we are ready to hijack the execution flow of the browser process. On non-CFG versions of Flash, this is the code that dereferences the overwritten vtable when calling the toString() method on a Vector object, as shown in the previous blog post: And this is the same part of the code in Flash 16.0.0.287 for Windows 8.1 Update 3 compiled with Control Flow Guard: The ___guard_check_icall_fptr function pointer points to ntdll!LdrpValidateUserCallTarget, which is in charge of checking if the destination address for the indirect call is legitimate. When reaching this CFG check with a fake vtable, an attempt to subvert the normal execution flow of the program will be detected and execution will ultimately go to the ntdll!RtlpHandleInvalidUserCallTarget function, which will terminate the process immediately by issuing an INT 29h: If you want to learn more about the internals of Control Flow Guard I recommend checking out the slides from the talk "Windows 10 Control Flow Guard Internals" [pdf] presented last year by researcher MJ011 at the Power Of Community security conference. Take advantage of a non-CFG module loaded in the same process. Find an indirect call that was not guarded by CFG for some reason. The first approach requires you to obtain a stack address, which I wasn't able to do having a pointer to an object in the heap as the starting point, despite having arbitrary read and write primitives after corrupting the length of the Vector. The second approach could introduce new dependencies on an exploit beyond the affected software, so it may not be ideal. I did find some indirect calls that are not protected by CFG, like the one below: That function pointer is located in the .data section which has read/write permissions, so overwriting it is definitely possible. However, the main problem with this approach is that you must be able to influence the execution flow of the program (while still not having gained code execution) so the overwritten function pointer is actually called. What if the function pointer is called only in uncommon situations like rare corner cases? What if the function pointer is called only early on process initialization? An additional obstacle in this approach is that if you have no CPU registers pointing nearby your data at the moment the overwritten function pointer is called, pivoting the stack in order to start a ROP chain can become tricky. 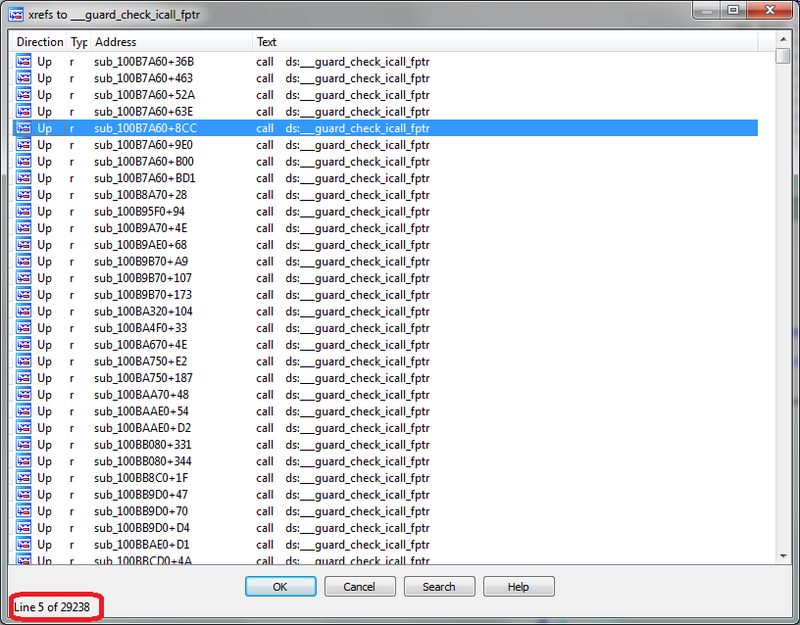 So far CFG is doing a great job protecting more than 29,000 indirect calls in this Adobe Flash Player binary. So the question is: can we find any indirect calls in Flash Player that are not protected by CFG, and then influence the execution flow of the program in a straightforward way in order to make it call an overwritten function pointer? Well, as stated before, Control Flow Guard protects indirect calls that could be identified at compile time. So the next question arises: are there any indirect calls in Flash Player that are not generated at compile time? And the answer is: yes! Flash Player includes a Just-In-Time (JIT) compiler, which translates ActionScript Virtual Machine bytecode to native code in order to improve its execution speed. The code generated by the JIT compiler includes indirect calls, and since this code is generated at runtime that means that indirect calls in it are not protected by Control Flow Guard. // or after JIT compilation of the invoker has failed. We are overwriting the pointer stored at VTable_object + 0xD4 with the address of our ROP chain (stored in the address_of_rop_chain variable in the ActionScript snippet above). Note that I'm storing address_of_rop_chain shifted 3 times to the right; that is because address_of_rop_chain has type uint, and the ActionScript Virtual Machine internally stores uint values shifted 3 times to the left and OR'ed with 6 (6 is the 'Integer' tag as shown in the previous blog post). Finally, we just need to invoke the toString() method on the ByteArray object , which is stored at this.the_vector. This will trigger the unguarded indirect call from JIT-generated code that will start our ROP chain. Note that at the moment the unguarded CALL EAX indirect call invokes our controlled function pointer, the ECX register points to our ROP chain, so pivoting the stack and starting the ROP chain is a trivial task. Control Flow Guard is a promising mitigation technology that will increase the difficulty and the costs of writing exploits. As with every known exploitation mitigation, there are ways to bypass it if certain conditions are met. The approach presented here, which consists of taking advantage of unguarded indirect calls present in JIT-generated code, could be possibly applied not only to Adobe Flash Player, but potentially to any software that makes use of a Just-In-Time compiler, since the code generated by it at runtime doesn't benefit from CFG, unless developers make an special effort to harden the code emitted by the JIT compiler. Note that Flash Player's JIT compiler has been abused in the past more than once in order to bypass mitigation mechanisms; see the "Pointer inference and JIT spraying" presentation by Dion Blazakis (2010) and the "Flash JIT - Spraying info leak gadgets" work by Fermín Serna (2013).